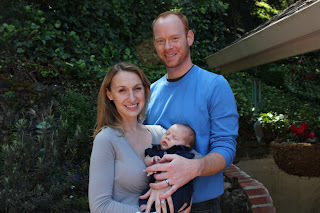 A Wide Line: Quinn’s Weekend Adventures: Happy First Easter, Baby! Quinn’s Weekend Adventures: Happy First Easter, Baby! To observe the Easter holiday, we took a weekend off from visiting breweries. Instead, we had a wonderful day with Matt’s extended family. Next year, Quinn will be old enough to participate in the Easter egg hunt with all his cousins. Finally, a family photo with our new little one. You can't tell, but I’m not wearing maternity pants! 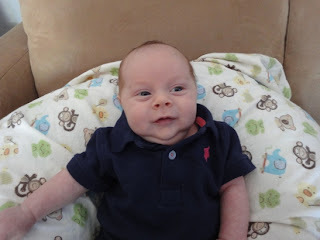 Quinn looked quite handsome in his blue polo onesie with the pink turtle. You can tell his hair is red, or reddish, in these pictures. I love it! My Grandma Betty crocheted this Easter bunny basket for me when I was a baby. 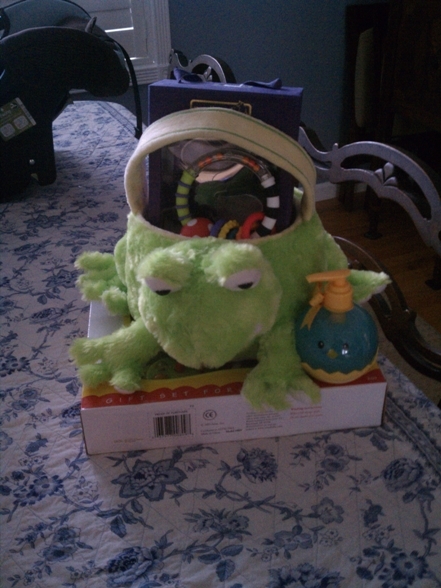 My mom sent it to me when she found out I was pregnant, so Matt and I filled it with goodies for Quinn. We gave him a Glow Worm that plays lullabies, some super cute socks, the classic book Guess How Much I Love You, and a book about baby sign language. Quinn must have been extra good this year because he received another Easter basket from Nama Mary. It was a plush frog basket that contained rattles, a cute outfit with a turtle on it and an adorable pair of sandals that we can’t wait for him to grow into. Know what else I can’t wait for? For Quinn to be old enough to get candy in his Easter basket so Mommy and Daddy can have some. 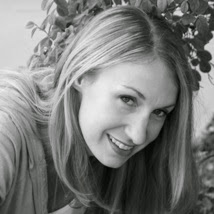 Quinn is adorable! You are a beautiful family.